Peter Donner on The Brink ride. Photo: Tom Diegel. Peter Donner’s mountain bike career started like those of many of us: early 90’s, dragged out and sandbagged by “friends” on a borrowed tank of a bike, bonked, overheated, crashed, bloodied, and traumatized on one of the hardest rides in the area…and excited to try it again. 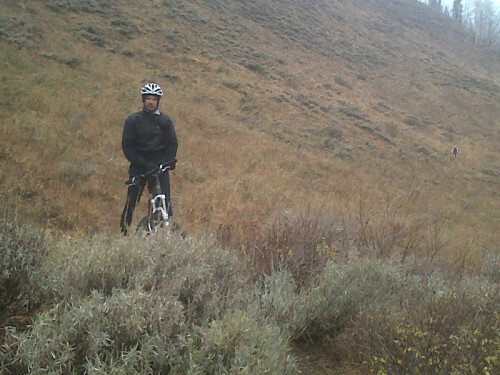 As time went on, he got his own bike and started to explore the trails that wound through the mountains above his home in Salt Lake City that would eventually become famous that first ride stayed so embedded in his mind that he continued to gravitate towards that original route, increasingly foresaking others. And so Peter’s name became indelibly associated with…The Brink. Describing The Brink, Gregg Bromka’s mountain biking guidebook to the Salt Lake area notes: “You’ll need route finding skills, tolerance, and stamina for harsh terrain, and solid sense of adventure, or this could become a mountain biking adventure come true.” With a description like this, and being so near the mostly-buffed, mostly-signed, and mostly moderate-graded hundreds of miles of trails nearby in Park City and Salt Lake City, The Brink sees very little traffic. The first climb is over 2000 feet and gets steeper as you go, with 1000 feet of that climbed in brutal, barely-rideable switchbacks in a little over a mile near the top. Add in the fact much of it is also due south facing, and in high summer the reality of riding on The Brink gets seared into the body and the mind. Mountain biking attracts a wide range of characters, but it’s fair to say that Peter is beyond the normal range. He is an economist with the State of Utah. It is not uncommon to find Peter simply standing in front of his whiteboard in his Capitol office staring at a melange of scribbled economic statistics and, in a manner reminiscent of Goodwill Hunting, suddenly finding “the” solution to some socio-economic issue facing the state. He lives alone (when we have tried to set him up with a nice girl he asks “will she Brink on the first date?”) in an unmaintained house decorated only with a huge poster of Pancho Villa in a nice area of town on a lot that is known to his neighbors as “Pete’s Jungle”, and on long summer evenings he can be found lounging on the porch reading the Congressional Budget Office’s ten year outlook. Weekday mornings he mounts his commuter bike and rides to work (he hasn’t missed a day in years, despite needing to look respectable in the Capitol and many harsh winter storms), and on weekends…well, Peter rides The Brink. Alone. From the Salt Lake Valley. Literally, every chance he gets. Despite his demanding job on Utah’s Capitol Hill, Peter also gets upwards of 100 days per year backcountry skiing, often just a quick run or two after work. When May rolls around he starts paying close attention to the snow plot on the backside of Lookout Mountain and, after years of experimentation, has become attuned to when The Brink melts and dries out. The first ride of the year always includes a saw sticking out of his enormous backpack, and some years the second ride is done with an axe as well to clear out that winter’s deadfall on the notorious “Woods of Despair”: a two mile section of very technical singletrack traversing a huge aspen-covered hillside that comes after all the climbing and much technical descending. Though some people may question the wisdom of doing an all-day, technical mountain bike ride with a large axe barely tucked into a fanny pack, Peter has thought it through and has never had a problem. And another year of Brinking begins. In 2005, after having many people ask him how many Brinks he had done, Peter started keeping track, and now he has a spreadsheet to monitor his annual Brinkage. 2011 was a decent year: despite the record snowfall in the Wasatch that winter that kept snow on the north facing slopes until June, the mild fall of last year enabled him to be only slightly lower than his average of 55 Brinks. Conversely, the mild winter of 2012 resulted in an earlier spring, and as of this writing Peter has set a new world record of 64 Brinks, with possibly another month of the season to go. He could put the record out of reach of…himself. Or not. But one record will likely stand the test of time; Peter estimates that his lifetime Brink total is about 700. And while most people who ride The Brink drive the 12 miles up the paved Emigration Canyon road to the trailhead, Peter has always ridden this section as well, making it a 40+ mile ride with 6000’ of vertical gain, which is 4.2 million feet of vert, all gained on one route. And despite the impressive heat of midsummer Utah and the fact that he arises every morning at 5am, he rarely leaves the house before 9am to – in his words – “take full advantage of the heat of the day”. His consistency prompted former Emigration Canyon resident and longtime Utah mountain bike racing king Bart Gillespie to dub Peter “Leatherman” for the deep tan on his back that Peter keeps bare for much of the ride. This intimate knowledge of one trail certainly has its advantages. On a recent Brink accompanied by three compatriots (an anomoly) for this article the area had seen an inch of rain the night before. Peter noted on the first climb that “grass was sticking to the tires, which means that the north facing descents will be too muddy!” but this advice was ignored by his fellow Brinkers. Not surprisingly, we did indeed paid the price of gummed-up tires on the steep north-facing descents. And he is acutely aware of how to mitre his efforts in order to navigate the mean switchbacks that twist agonizingly upward towards the ridge, and which pungies get hidden first by leaves, and which slopy logs are slick, and….and.. Despite his many hours in the saddle, Peter’s not fast; he is perfectly happy to chug along the Brink at a very mellow pace, and if they look closely, the few fellow Brinkers out there can spot the grass matted down under shady scrub oaks where Peter likes to nap; usually a midsummer Brink will include at least three nice naps. Though some days he has been known to forego the naps and instead embark on the SuperBrink; adding in another 3 hour loop to the south of the Brink that is equally rough, challenging, and remote (Saturday SuperBrinks are always followed by Sunday Recovery Brinks). While Peter does virtually all of these rides alone, he is not necessarily a loner per se; he likes company, but only if he has sized them up to find out if they are good enough thinkers to match his keen intellect. There are few people who can spend an entire day pondering all of the economic implications of a newly-opened Myanmar, and Peter is one of them. He just happens to do it…on The Brink.